So it seems I was slacking a bit last month. Things have been crazy and I’m ready to get back to blogging more regularly. I received both of my Sample Society boxes for April and May, and thought this would be a great place to jump back into things. This is an itty bitty sample. The color isn’t bad though, and I definitely think it would compliment a variety of skin tones. I absolutely hate this product. I’ve used it more times than I can count, and it does nothing for me. I use it to try and use up the samples, or when I’m in a pinch, but I don’t believe it does a thing. Am I alone in this? I’m a huge Marc Jacobs fan, but this isn’t for me. I LOVE this line. So happy to have another sample. It makes my hair feel AMAZING. I love lavender, but this was a bit too strong for me. I had to throw it out because it was giving me a headache. Super bummed. This candle couldn’t smell better if it tried. I can’t stop smelling it, and want to use it constantly. Major love for this one. Overall I think this wasn’t a bad box, but I know I’ve seen better from Sample Society. John Frieda Luxurious Volume In-Shower Treatment– I don’t really need this since I have gigantic hair. Definitely swapping this one. Alterna Caviar Repair Multi-Vitamin Heat Protection Spray– I’m excited to try this. I always need something to protect my hair from my insanely hot flat iron, and I’m willing to give this a shot. Avene Thermal Spring Water Spray – I wasn’t sure what to make of this. Anyone out there a fan? Right now it is in my swap pile! Julep Lip Gloss in Graceful – Love Julep lip glosses! The color is super sheer, but I can use it. Laneige Water Sleeping Mask– I’m always up to try new face masks! Verdict: Not bad! 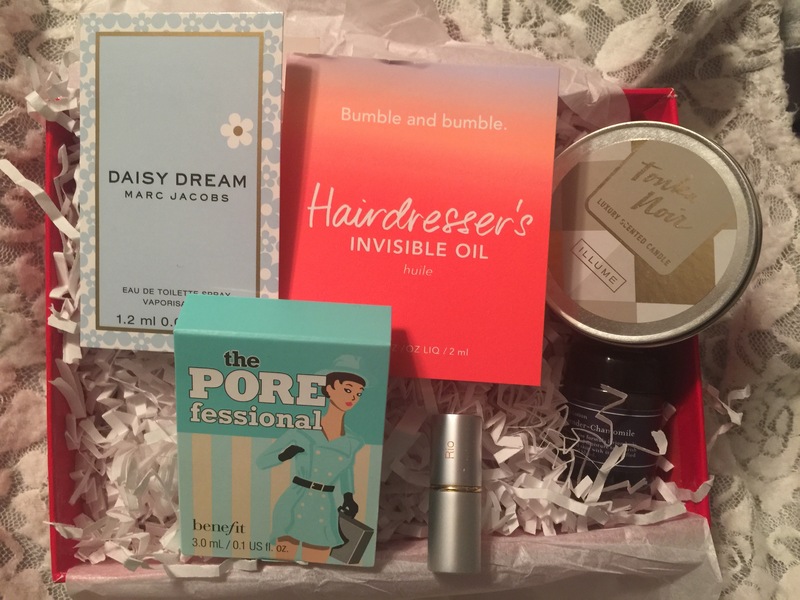 This box had some fun products for me to try, and a nice box for spring!